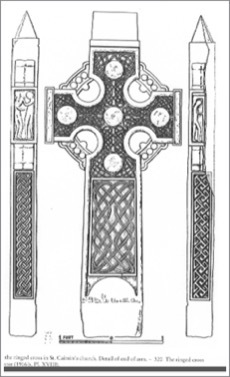 This page highlights the crosses of County Clare. These include Dysert O’Dea, Inis Cealtra, Kells, Kilfenora, Killaloe, Killnaboy, Noughaval, and Skeaghavannoe. 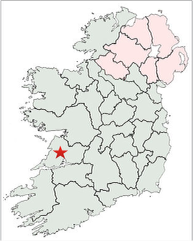 County Clare is located with a star on the map to the right. The Monastery: According to tradition, St. Tola founded the Dysert O’Dea monastery. The year of its establishment is not clear. However, the Annals of Ulster for 738 refer to the death of St. Tola, Bishop of Cluain. Other dates in the 730’s have also been offered for his death. It is likely, therefore, that the monastery was founded in the late 7th or early 8th century. In addition to the High Cross, which will be described in detail below, there are additional features of the monastery that are of note. Another feature of the site is the stump of a round tower, which can be seen the photo below right. The base has a panel of interlace, part of which was cut away to create a surface for the inscription mentioned above. See the photo below. The shaft of the cross contains an image identified as a bishop or abbot as seen in the photo below left. The figure wears a mitre what was originally pointed. In the left hand is a crozier. The right hand is missing and appears to have originally been an insert. (Harbison, 1992, p. 84) Writing in 1899, George MacNamara simply assumes that the figure represents Saint Tola. (MacNamara, 1899, p. 249) While this identification is appealing, it is by no means certain. What is certain is that more than 350 years after the death of St. Tola, no one knew what he looked like. The head is seen in the photo to the right. The Base contains a very stylized image of Daniel in the Lion’s Den as seen in the illustration below left. 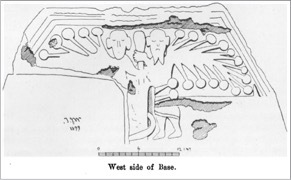 (MacNamara, 1899, p. 248) Harbison notes that Porter suggests this image may represent Gunnar in the Serpent’s Den. This refers to a Norse legend that would have been known from the 10th century. Deciding between the two identifications of the image calls on the interpreter to read the mind of the artist as both stories have similar content. This image is very different than most of the High Cross images of Daniel in the Lion’s Den. "S 1: Two animals back to back, their heads turned around to face one another. Each devours the end of an (animal?) interlace which coils around their respective bodies. "S 2: Two interlaced animals with a human head between their snouts. A narrow band of interlace coils between them. “S 3: A single animal, now headless because the top of the panel has been damaged. It coils to form a figure of eight, interspersed with a narrower band of interlace. The base has an image that has been interpreted in a number of ways but likely it represents Adam and Eve in the garden. The illustration to the left below is from MacNamera. The image to the right shows the same scene as it appeared in 2008. "W 1: A damaged horizontal panel of animal interlace. “W 2: Sunken or relief crosses in panels with stepped edges. “W 3: A horizontal panel of two crossing and interlaced animals. “W 4: An upright panel of two interlaced animals intertwined with a narrower ribbon-serpent. The top of the panel has been removed. “W 5: A panel divided into four quadrants with a circle at the centre, forming the motif of a cross, the expanded terminals of which break through the sides of a central square with bosses at each corner. 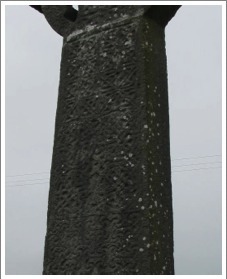 There are sunken fields of L- and other shapes.” This panel is not illustrated to the left but can be seen in its current very worn condition on the photo below of the head and upper shaft of the west face, and in the illustration from MacNamara, also below. The Base contains a carving that has created considerable speculation. As seen below, it depicts four men, standing at various angles but all facing forward. The two in the center hold “a staff with a tau or crutch head, (MacNamara, 1899, p.249, also the source of the illustration below) or “a staff expanding or blossoming to left and right at the top.” (Harbison, 1992, p. 85) Buckley notes the “boss and sharp point at its lower end.” (Buckley, p. 248) There are two additional figures, flanking the men holding the staff on the left and right. The left hand figure holds what appears to be a short crozier. The right hand figure is missing the left arm. It may have held a staff. Buckley finds this scene to be consistent with two bishops, the outer figures, observing or blessing two monks as they take possession of a piece of land. While Harbison chooses not to speculate on exactly what this scene depicts. He finds some parallels in images of Joseph Interpreting the Dream of Pharaoh’s Butler or a story from the Paul and Anthony cycle of the Desert Father. “N 1: Two animals with open mouths and raised paws facing one another, and having a narrow interlace coiling among them. “N 2: Two interlacing animals with their heads facing upwards, and with a narrow ribbon of interlace coiling among them. “N 3: A damaged panel with two animals with broad bodies being interlaced by a narrow ribbon. Getting There: See the Road Atlas page 41, C 3. 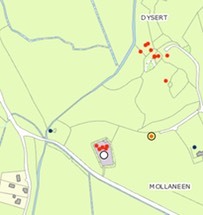 The site is named on the atlas as Dysert O Dea Church and Round Tower. Located west of the R476 between Ennis and Corroein. The cross stands alone in a field, the church is down the hill. 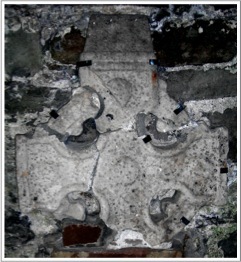 As illustrated in the two photos above, the ringed cross consists of fragments of the original cross: the head has been pieced together and is attached to an inner wall of St. Caimin’s church. The base and shaft are located outside near the round tower. On the head, as pictured above, three characteristics are clear. There are four bosses, one in the center, one on the upper extension and one each on the arms. 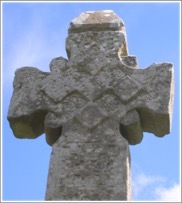 Rolled moulding is clearly visible on the cross and the ring. The cap is roof shaped and has no decoration. The other face of the cross is against the wall. While parts of it are apparently broken away, Macalister suggests it may have been decorated. The illustration reveals a figural carving on the end of each arm. On what is identified as the east arm Harbison identifies Samuel Anointing Saul or David. Macalister identifies Adam and Eve. Harbison has this to say about this panel: “Two figures stand opposite one another, clad to above the knees. 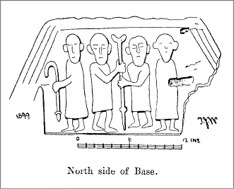 The figure on the right holds up what seems to be a horn in the left hand, while that on the left extends the right fore-arm.” (Harbison, 1992, p. 99) In the illustration above the clothing described by Harbison is not apparent. The East Cross is ringless and stands about 1.6m high. The edges have roll moulding. 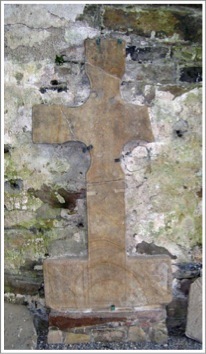 The surface of the cross is badly worn but Macalister produced a drawing illustrated below. (Harbison, 1992, vol. 3, fig. 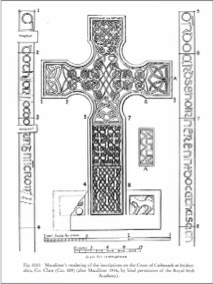 1015) This drawing shows a very complex and lovely pattern, or more precisely, patterns of interlace covering the face of the cross. Like the West Cross, there is a rectangular panel on each side of the foot of the cross. The left side is broken off. On the right side there is a panel that shows a quadruped with a human leg hanging from its mouth. 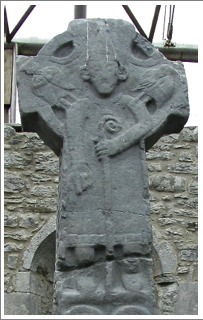 The west cross is ringless and is attached to an inner wall of St. Caimin’s church. It stands about 1.9m high. The right arm is broken. The edges of the cross have roll mouldings. No decoration is visible on the cross. While the sides and back are not visible, Macalister reported that the back was plain. Liam de Paor (historian, archaeologist and political thinker) discovered a “finely-carved Romanesque head” during an excavation on Inis Cealtra. 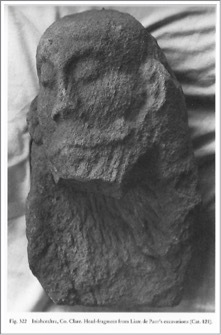 He identified it as a head of Christ related to a 12th century High Cross. It is in the possession of the National Museum in Dublin. The head stands out in relief. Christ’s eyes appear to be closed. He has a flowing mustache and a beard. The head is tilted to one side, suggesting that Christ is represented as dead on the cross. (Harbison, 1992, p. 99, Vol. 2 Figure 322) This would make the head, and the cross it was part of, unusual in that on most of the High Crosses, where there is a crucifixion scene, Jesus is depicted with head erect and eyes open, more triumphant than defeated. Inis Cealtra is a lovely island located in Loch Derg, just southwest of the Mountshannon harbor and not far from the shore. It is only accessible by boat. 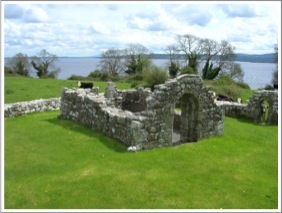 In the old Irish the name can be translated literally as Island Church, hence Church Island. . 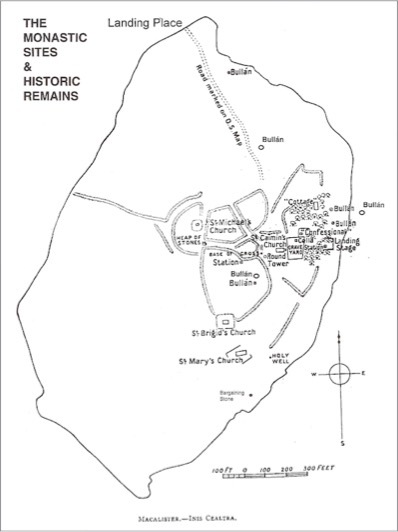 It is also referred to as “Holy Island” (Madden, p. 5) The ruins of numerous buildings are located on the island. 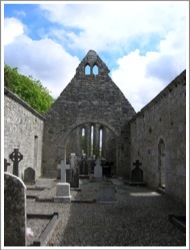 A monastery was first founded on Inis Cealtra around 520 by St. Colum mac Crimthan, a Leinster saint and one of the Twelve Apostles of Ireland. (Macalister p. 130). The Twelve Apostles were twelve 6th century Irish saints who all studied under St Finian at Clonard Abbey in County Meath. His name is also recorded as Columba or Mac Hy-Crimthainn. This same Colum was associated with the monastery at Terryglass (Tir Dha Ghlas or land of the two streams) in County Tipperary. According to this tradition Inis Cealtra was founded as one of a group of communities St. Colum established in the area of Loch Derg. Hagiography tells us that he was guided there by an angel, and that the same angel guided MacCreiche the anchorite to depart from the island. Colum brought numerous monks with him, a ready made community. Macalister suggests that at some point Colum left the district because it was too heavily populated. (Macalister, p. 130) Madden, on the other hand, believes Colum remained. He bases this on an entry in the Annals of the Four Masters that refers to Marcan, Abbot of Inis (Cealtra d. 1009), as Coarb (successor) of Colum Mac Criomthuinn. The school at Inis Cealtra was of some repute in Ireland and on the continent. Healy described it as “another celebrated nursery of ancient sanctity and learning.” (Healy, 512) It flourished during the seventh and eighth centuries but continued long after. This was a place “where the saints of old sought communion with God, and spent their lives in prayer, and fasting, and sacred study.” (Healy 513) As an example of the emphasis on learning in the monastery it is noted that in addition to Caimin’s commentary on the Psalms, St Coelan (Kalian), a monk of Inis Cealtra who lived in the eighth century, wrote a life of St. Bridget. It is also reported that students came not only from Ireland but from the continent as well. Two additional leaders of the monastery, with 8th century dates, are mentioned in the Annals. They are Diarmait and Kellach. The death of Diarmait, an Abbot, is recorded in 749 by the Annals of Innisfallen. For the year 780, the Annals of the Four Masters records the death of Mochtighern, a wise man who was the son of Kellach, Abbot of Inis Cealtra. Like so many other monasteries Inis Cealtra was plundered by Vikings. The first time was in 836. The Annals of the Four Masters reports that in that year the Danes burned the churches of Laichtreine, Inis Cealtra and Kill-Finche. Nearly a century later, in 922, the Annals of Innisfallen record that Tomrar, son of Elgi, a Norseman plundered Inis Cealtra and “drowned (cast into the lough) its shrines and its relics and its books.” In this attack many monks were killed. The Annals of the Four Masters mention two tenth century Abbots. They are Diarmaid and Maol-Keallaigh. 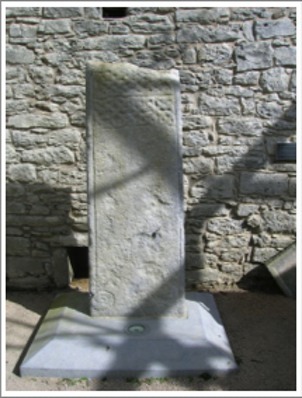 One citation reads “M.951.4 Diarmaid, son of Caicher, Bishop of Inis-Cealtra died.” The other, a citation for 967, records the death of Maolgorm, the son of Maol-Keallaigh, Abbot of Inis Cealtra. 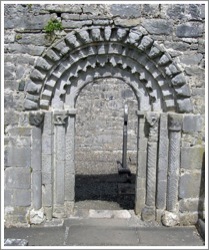 Three inhabitants of the monastery in the eleventh century are noted: Corcran, Marcan and Cathasach. 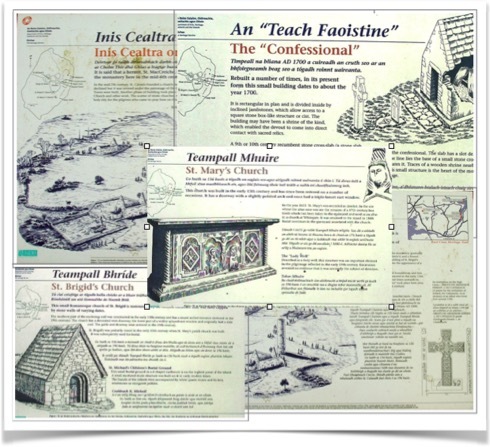 When the diocesan system was formalized in Ireland at the Synod of Rathbreasail in 1111, Inis Cealtra was assigned to the diocese of Killaloe. It is not clear when the monastery ceased to function but in 1210 St. Caimin’s church gave way to St. Mary’s as the parish church. After 1615, largely as a result of the Reformation, the buildings on Inis Cealtra were finally all left derelict. Getting There, a personal journey. In May of 2008 I was visiting Ireland. The goal of my two week trip was to locate and visit a group of Irish High Crosses. I wanted to see the cross or crosses and to spend some time at each site. I was hoping to experience the spirituality of each place. The afternoon of my first day in Ireland I found myself in Killaloe, a community in County Clare, along the beautiful Shannon River at the south end of Lough Derg. The Information Center there had just opened for the year that very day. The attendants there helped me make contact with a man named Ger Madden. 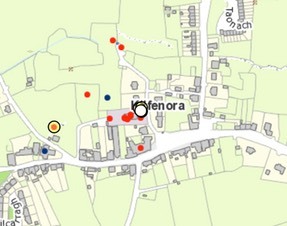 Ger is a local historian who has a special interest in Inis Cealtra. In fact he has written a booklet on the subject “Inis Cealtra: Jewel of the Lough”. He and I made arrangements to meet the next day in the late morning. I found Ger at the Mountshannon marina where he takes folk to the island on a regular basis. I was his only customer for the day, so we took a small motor boat out to the island. He dropped me off at a dock on the north side of the island. He returned to the harbor and left me alone for a couple of hours so I could explore the island in peace. There's a caretaker on the island who provides some security, maintains the grounds and cares for some cattle. Otherwise the island was deserted. I met the caretaker while he was weed eating in the cemetery. We visited for a few minutes, but mostly I had the island to myself. There are numerous ruins and sacred sites on the island. I was particularly interested in the three crosses described above. I had purchased a copy of Ger’s book at the harbor so I had a map of the island with the locations and information about the various sites. With or without the booklet the sites are well signposted as the collage below illustrates. As I moved around the island, from one ancient site to the next I felt the thinness of the place, the presence of the Holy, or, as J. Phillip Newell might say, I found myself “Listening for the The Heartbeat of God.” I thought about the countless souls who had journey here across the centuries in search of God, of holiness, of renewal, of a strong education steeped in scripture, of a community where life was prayer. I thought of those who had and, like me, continue to make pilgrimage to this Holy Island. A couple of hours later I met Ger at the dock and he took me back to Mountshannon harbor. Dark clouds were rolling in from the southwest and I sat in my car and ate my lunch while it poured rain for a few minutes. By the time I drove away I was refreshed and renewed in body and spirit. I left Inis Cealtra in my wake, looking for more of the sacred places of the Emerald Isle. But it is always in my heart as one of the very special holy places I have visited in Ireland. Getting There: See the Road Atlas page 43, A 1. 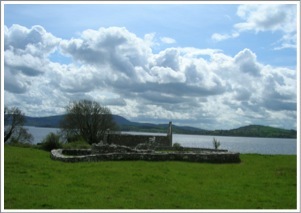 Located on an island in Loch Derg, the site is accessible only by boat from Mountshannon. The map is from the Historic Environment Viewer. 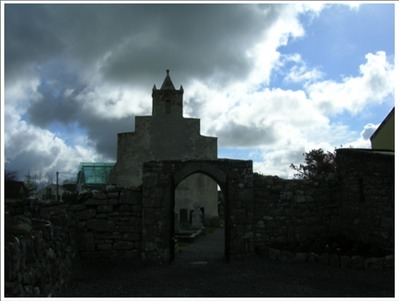 “560 A.D. St. Fachtnan establishes a monastery in Kilfenora. Born in West Cork and a student of both St. Ita and St. Finbar, Irish Martyrology lists Fachtnan as Bishop of Ross and Kilfenora. A sixth century teacher who lost his sight and, unable to read or write, prayed to God for his sight to be restored. His prayers were answered and it is suggested that in thanksgiving for this favour, he founded a monastery in Kilfenora. Following the establishment of the monastery, tradition says that St. Fachtnan lived the remainder of his life in Kilfenora and died there circa 590 A.D. His feast day is remembered on Dec. 20th. 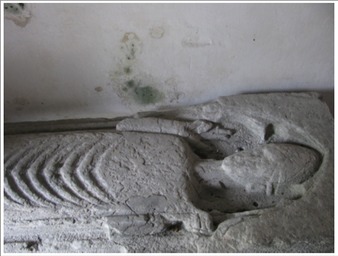 Just inside the doors to the present Cathedral there is an effigy of a bishop (image left). 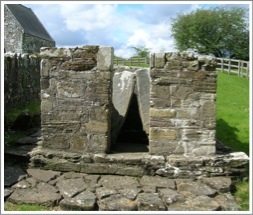 As we will learn below, Kilfenora was an episcopal see. “1002 A.D. Newly crowned High King of Ireland Brian Boru places enormous levies on the people of the Kilfenora area to maintain his army. During his reign the people of Corcomroe paid annual levies of 1,000 cows, 1,000 oxen, 1,000 rams and 1,000 cloaks. “1055 A.D. In a raid into Corcomroe, Murough, grandson of Brian Boru, burned the Abbey of Kilfenora, plundering houses, and killing 100 inhabitants. “1056 A.D. Renovation of the church is commenced. “1058 A.D. Renovation of the church is completed and is considered one of the finest churches in Ireland. 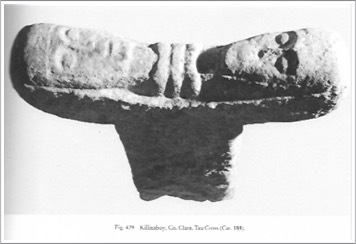 The next entries in the Timeline take us into the twelfth century, the time period when the High Crosses of Kilfenora were carved and erected as indicated by the text for 1152 c.e. “1111 A.D. The Synod of Rathbreasail; the European Diocesan system was introduced. 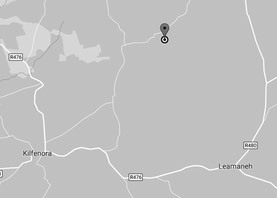 Kilfenora at this time did not retain its Bishopric. 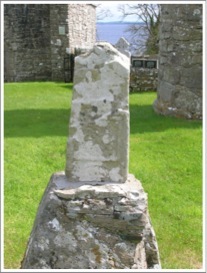 “1128 A.D. Finguirt, Confessor of Corcomroe, died in the Cathedral of Kilfenora. Confessor in Irish was ‘Anamchara’ meaning soul friend and was considered so important to novice monks that to be without one was like a body without a head. “1152 A.D. At the Synod of Kells, under Cardinal John Papro, tribal chiefs of Corcomroe renewed their efforts to have the Bishopric retained. In a show of unity, renovation of the cathedral and the carving of high crosses began. (The image to the right shows part of the transept of the 12th century cathedral. It is covered to protect the High Crosses that are displayed inside.) Such was their determination that Kilfenora succeeded in retaining its standing and was listed as one of the thirteen Diocese in the province of Cashel. One of the smallest Diocese in the country, it also included the Aran Islands. Renovation on the cathedral at this point can still be viewed in the east window of the Chancel. The carvings at the top of the two pillars which divide the three lights date from this time. 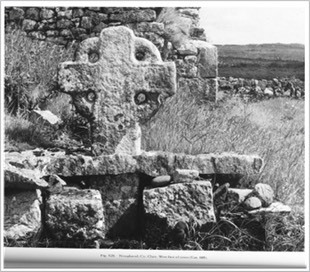 Below are photographs and descriptions of six of the seven Kilfenora crosses. Two complete crosses and shaft fragments of two others are on display in the re-roofed transept of the cathedral. An additional cross is in a field to the west of the cathedral. 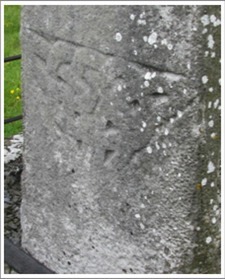 A sixth cross, the one moved to Killaloe in 1821, is also considered below. This cross takes its name from a family who used the lower portion of the shaft upside down as a tombstone until it was discovered it was part of a cross and was reassembled. Below, to the left, is the east face of the cross with the south face also visible. The lower portion of the east face, seen to the right, appears to be one image. At the top are two clerics. The one on the left holds a "drop-head" crozier while the one on the right holds a "tau-shaped" crozier. The "tau" crozier suggests an identification for the right figure as that of St. Anthony of the Desert. This in turn suggests that his companion is St. Paul, a fellow-hermit. Both are late 3rd or early 4th century figures. They stand with their arms entwined. The base of St. Anthony's crozier is thrust into the neck of a strange winged beast below the feet of the saints. This suggests an image of St. Anthony overcoming evil. The beast in turn is atop two human heads. It appears that one of the beast's legs is on the head of the human figure to the right. "This figure may hold the bottom of one of the beast's legs in its left hand, while beside it -- to the left -- a similar figure raises its left hand to catch the beast's other leg, and its right hand is raised to ward off the claw-like tail of the beast above it." (Harbison, 1992, p. 114) It is possible there was originally more of these figures below the present bottom of the shaft. The image may lift up St. Anthony's struggle against the forces of evil on behalf of humanity. The human family constantly struggling with the forces of evil. 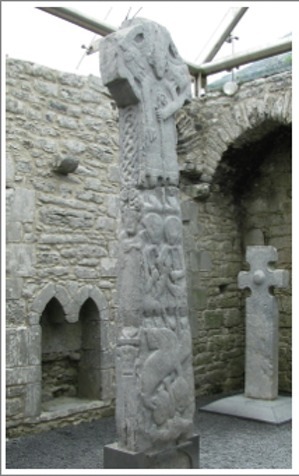 The upper part of the shaft and the head of the cross, seen to the left, have an image of a bishop or an abbot. Given the fact that the Synod of Rathbreasail in 1111 c.e. established the episcopal system for all of Ireland, it is likely this is intended to be a bishop. The crozier he holds in his left hand has a volute head. He wears a pointed mitre. There is an angel on each of his shoulders. High right hand points downward as if to indicate the scene below. 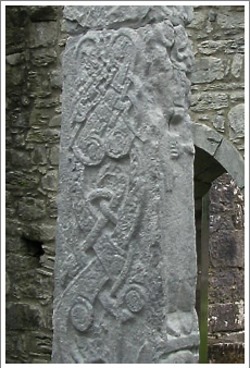 "North Side: On the shaft an irregular interlace, possibly terminating in an animal head above left, is surmounted by a checker-board pattern. The head of the cross (left) has an image of the crucified cross. There is a bird above and below each arm. The figure must have originally extended into the top of the shaft but that area of the cross is extremely worn. The upper part of the shaft (lower right), above the head of the horseman, is composed of "ornamental scrolls interlaced by what would seem to be a narrow-bodied animal, terminating in a figure of eight formation at the top. This is an unringed cross that is about six feet in height. Before being moved into the transept for protection, it was located near the north-west corner of the Cathedral churchyard. It is now, ironically, located in the southeast corner of the transept. What was the east face of the cross now faces the transept. This east face (left) is decorated with a boss in the center and roll mouldings on the edges. These mouldings curl into spirals at the top of the shaft. 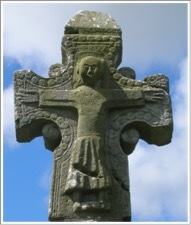 On the west face (right) there is decoration on the head of the cross. Peter Harbison describes it as follows: "Right across the arms there is a field of Stafford knots. Beneath it there is a square panel consisting of four interlinked knots of pointed triangular interlace, with a double spiral on each side of it at the top of the shaft. The top has a panel of pointed interlace, flanked beneath and on the right by a meander motif." (Harbison, 1992, p. 115) The images below from the display plaques illustrate the design on each face of the cross. This partial cross shaft was found in 1954 and was placed south of the door to the Cathedral before being moved into the transept for protection. It is about six feet in height. There is roll moulding along the sides that curls into spirals at the bottom of the shaft. The only discernible carving is toward the top of the shaft on each face. The West face (not pictured) has a partial panel of interlace near the top. This shaft-fragment is identified by Harbison as #137, Shaft-fragment in the Cathedral chancel. (Harbison 1992, p. 116) It stands in the northeast corner of the transept and is mounted on a modern lower shaft segment. The side facing south is described by Harbison as the West Face. "The west face (left) has interlacing forming circular devices, above which is a segment of a circle of interlace, suggesting that it may have formed part of the decoration of the ring of the head. These designs can be seen more clearly in the image from the display plaque pictured below. The West Cross is located in a field west of the Cathedral. It is a perforated ringed cross with cylinders on the inside of the ring. Two other features of note are not readily visible in the photos we have. Peter Harbison tells us that Christ has a square satchel or reliquary suspended around his neck that hangs on his abdomen. Harbison does not venture a guess as to the meaning of this. If it is a book satchel, it might represent Christ bringing the good news of the Gospel to the world. The North and South sides of the cross are undecorated except for the end of the arm on the North side where there is a square of interlace. The West face of the cross is filled with geometric design. Near the base there is a triangle of interlace pointing downward (see below left). 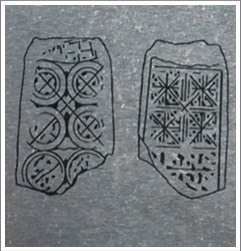 "The upper half is filled with interlocking pelta-shapes, together with interlace forming four circular , and above it, four square devices (below right). The Head "has a circular fretwork panel surrounded by a rope moulding. Two-strand interlace flanks it on the arms and on the shaft below, but the interlace at the top is slingle-strand." (Harbison, 1992, p. 116) This design could be interpreted as a sun symbol, perhaps representing the Risen Christ. Getting There: See the Road Atlas page 41, B 2. Located in St. Fachtnan’s Church of Ireland in the town of Kilfenora. 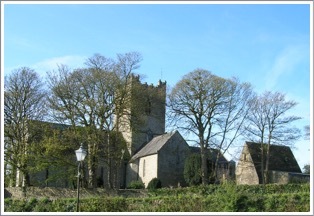 The church is located behind (north) of the Burren Centre. 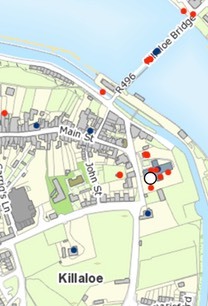 The map is from the Historic Environment Viewer. 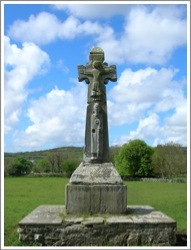 A cross was moved from Kilfenora to Killaloe in the nineteenth century. It is presently erected in the nave of the Killaloe Cathedral and will be described below related to Killaloe. The monastery at Killaloe in County Clare has a fascinating history. Part one of this article provides an overview of that ecclesiastic history from the origin of the monastery to 1267 C.E. 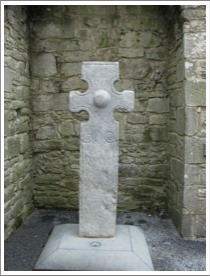 There are two High Crosses presently located in the nave of St. Flannan’s Cathedral in Killaloe. One is a reconstructed cross, the other a fragment. 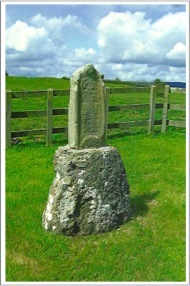 The restored cross, is a recent arrival. It was moved to Killaloe from Kilfenora in 1821. The other cross is enigmatic. Its provenance is unknown. Could it have its origins at Killaloe? Its inscriptions raise questions about dating the cross and explaining its erection by a Scandanavian. Part two of this article will describe both crosses and speculate on the implications of what we know of the enigmatic cross fragment. 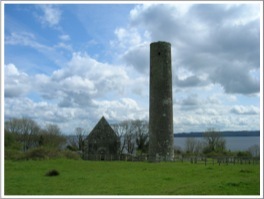 The photo to the right was taken in 2008 and shows St. Flannan’s Cathedral from the east. 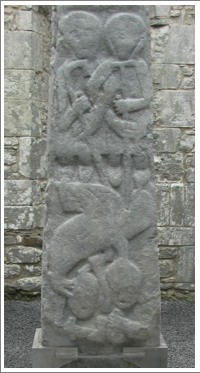 During the eleventh and twelfth centuries attacks on Killaloe came not from the Vikings but from Connacht. There are attacks on record for the years 1062, 1081 and 1084. In 1088, Domnhnail MacLochlainn, King of Aileach, in Ulster, destroyed Kincora. Kincora was the residence of the king. 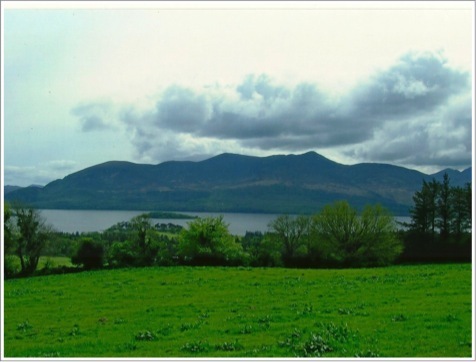 It was located just over 1000 feet to the west of the monastery, known as Killaloe. (Westropp p. 407, 410) In 1116 Turlogh O’Connor burned Kincora, and he did it again in 1119. 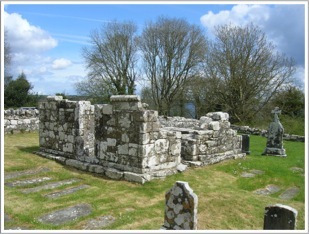 In 1185 the first cathedral church was destroyed by Cathal Carrach of Connacht. It is unclear whether the monastery was attacked and/or destroyed each time Kincora was attacked, but it seems likely. The artists rendering, to the left, of what Brian may have looked like was found at aohflorida.org, Ancient Order of Hibernians: Florida State Board, 9/2015. The abbots of the monastery from the tenth to the thirteenth century were all members of the ruling Dal Cais dynasty or one of its collateral branches. Eight abbots are mentioned in the annals and genealogies. Scandlan mac Taidc (ob. 991, AI), was probably a member of the Ui Ailgile. He was succeeded by Marcan mac Cennetig (ob. 1010), brother of Brian Boru. He was also abbot of Inniscaltra and Terryglass. Next came Cathal mac Maine (ob. 1013). His father was Brian’s first-cousin. The Dal Cais dynasty, of which Brian Boru was a member, was involved early in the church reform movement that culminated at the Synod of Raith Bresail in 1111. One of the leaders of the reform movement, Domnall Ua hEnna (1023-98) was a member of the hereditary clerical family and bishop of Killaloe. He was the leader of the reform movement up to his death. Domnall Ua hEnna, bishop 1216-? As his name suggests, Robert Travers was the exception to the rule. 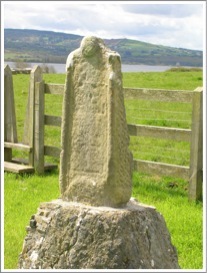 Following the death of Conchobar in 1216 there were rivals for the episcopal succession at Killaloe. Donal Ua hEnna was elected in 1216 but Geoffrey de Marisco, the justiciar of Ireland for the English throne, sought the position for his nephew Robert Travers without canonical election. Exactly who exercised episcopal authority during that time is not clear. In 1221 Domnall was elected once more but Robert continued to claim the title. 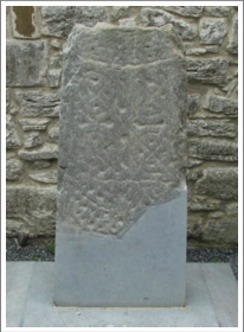 The limestone cross described below was carved and originally located at Kilfenora. 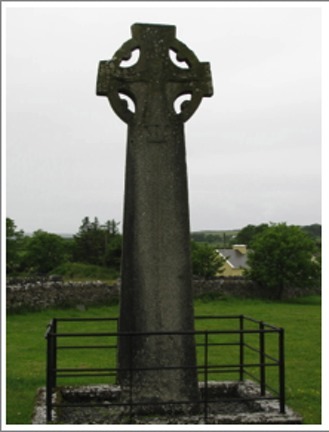 This cross was moved from Kilfenora to Killaloe in 1821 by Dr. Richard Mant, Bishop of Killaloe and Kilfenora (Church of Ireland). When Harbison described it in his 1992 The High Crosses of Ireland, it was built into a wall on the interior of the cathedral. It now stands in the nave of the cathedral, with some modern parts added to make it whole . The cross stands nearly 14 feet in height. It is a little over 3 feet across the arms. The West Face (left) has interlace beginning near the top of the shaft and covering the arms. This decoration is not visible in the photo to the left taken in 2008 by the author, but can be seen in some detail in the photo to the right taken in 1930. (Harbison, 1992, Vol. 2, Fig. 400) It was this side of the cross that was attached to the wall of the cathedral. 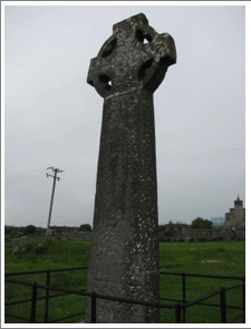 The photo on the left is from a plaque located in the church at Kilfenora describing the cross at Killaloe..That on the right was taken in 2008 by the author. Set on a pedestal in the nave of the Cathedral is a very unique stone whose provenance is not clear. 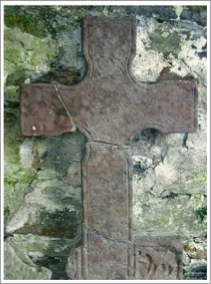 Could it be a fragment of a High Cross that had its origins at the Killaloe monastery? When Macalister took note of it in 1916, it was built into a wall of the Cathedral. Only one side was showing and Macalister was surprised to see that it contained Runic letters. 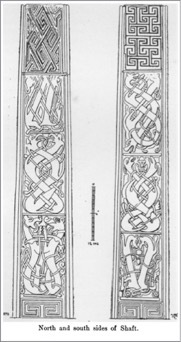 This turned out to be an inscription that was clear to read: “Thorgrim raised this cross.” As shown in the illustration to the left above, Macalister took this to be the dexter arm of a cross. At that time only two other Runic inscriptions had been found in Ireland. This made the find extremely unique and interesting. The illustration above right is from Macalister, p. 493. The photo below left was taken by the author in 2008, that to the right is from Harbison, 1992, Vol. 2, Fig. 401. The name Thorgrim is clearly Scandinavian. Macalister concluded that “Thorgrim, in spite of his heathenish name, must have been at least Christian enough to erect a cross.” (Macalister, p. 497) As noted above, the Viking raids on this part of Ireland began in the ninth century. By the early eleventh century a process of assimilation of these Vikings into the Irish population had at least begun. At some point in time, the stone was removed from the wall and the other three sides became visible. What was revealed brought additional surprises and a reconsideration of the part of a cross that it represented. The first surprise was found on the East Side of the stone. 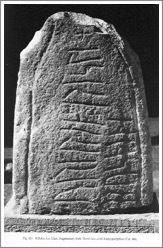 There is an Ogham inscription that reads: “Prayer for Thorgrim.” So the same name appears in both the language of Scandinavia and that of Ireland. The identity of Thorgrim may never be known. The two inscriptions suggest that he bridged the gulf between two cultures. That he is mentioned at all suggests he was a person of some importance. His sponsorship of a cross suggests he was, at least nominally a Christian. The photo left was taken in 2008 by the author, that to the right is from Harbison, 1992, Vol. 2, Fig. 401. 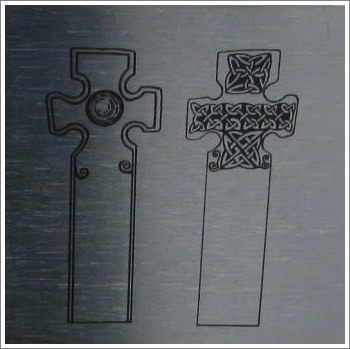 The presence of both an Ogham inscription and a Runic inscription on the cross, referencing the same name adds some complexity to the process of dating the cross. Runes continued in use, in a Scandanavian context, throughout the period under consideration. 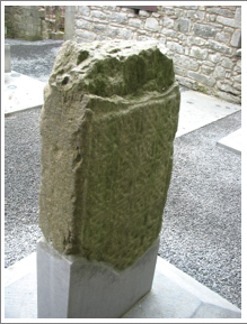 The gradual disappearance of Ogham inscriptions after the ninth century argues for an earlier rather than a later date for the cross fragment, perhaps as early as the late tenth century. That a Viking, presumably associated with Limerick might have had a cross erected might argue for a later rather than an earlier date. So a range of possible dates from the late tenth to the mid eleventh century, seems reasonable. This fits well with Macalister’s suggestion of the first half of the eleventh century as a date for the cross. The second surprise following the removal of the stone from the wall was the presence, on what is now the south face of the cross, of a carving that appears to be Christ crucified. The orientation of this carving caused a reappraisal of the part of a cross the fragment represents. Harbison suggests that the fragment was from the upper portion of the shaft of a cross, just below the head. This aligns the carving on the south face properly and means the Runic inscription was carved sideways from bottom to top. The carving identified as Christ crucified is primitive in style. The figure is off center to the right. Above Christ’s arms may be carvings of angels. The photo to the left above was taken in 2008, that to the right is from Harbison, 1992, Vol. 2, Fig. 402. The primitive nature of the carving seems at odds with the power and prestige of the monastery in the early eleventh century. The monastery at Killaloe was experiencing the heights of power and prestige in the early eleventh century. 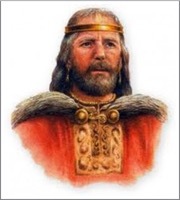 Brian Boru was High King of Ireland and his capital of Kincora overlooked the monastery. He was a patron of the churches and monasteries in the area. Family members were in positions of leadership in the monastic communities of the area. 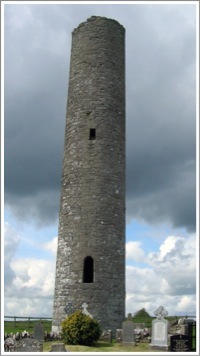 The Viking community at Limerick was prospering in spite of conflict with the Irish under the leadership of Brian Boru. We might expect carving of a higher quality than we have on this cross fragment. Where did this the cross, of which this fragment was a part, originate? 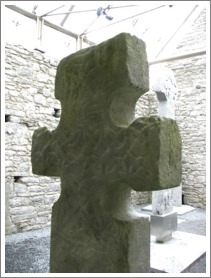 Based on the importance of Killaloe as an ecclesiastic and political center in the eleventh and twelfth centuries, it is reasonable to think that there were crosses at the monastery. We know, from fragments such as this, that many crosses were damaged or destroyed over the course of time. The most that can be said is that it is possible that the cross from which this fragment comes may have had its origins at Killaloe. Getting There: See the Road Atlas page 42, G/H 4. 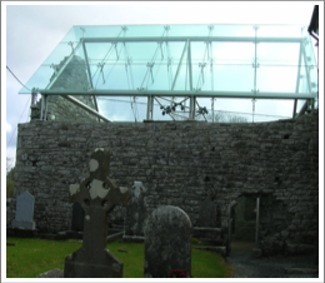 Located in Saint Flannan’s Cathedral in Killaloe, along the R463. The crosses are inside the nave of the church. See the map to the right. 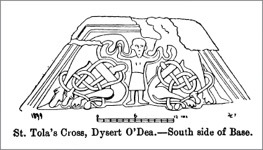 This fragment is the head of a Tau Cross, one of only two in Ireland. It was originally near the road north of Killinaboy. It is on display in the Clare Heritage Centre in Corofin. The sides of the cross are flat, with no carving. The top of the cross has a face carved on each arm with three ribs running across between them. There is nothing to indicate the identity of the faces. However, the tau cross form is associated with St. Anthony the Hermit, who is identified by a tau shaped crozier. 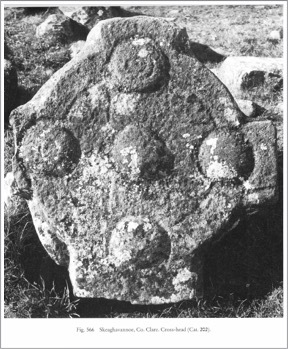 This led Harbison to speculate that the faces might belong to St. Anthony and St. Paul of the Desert.This may have been a wayside cross, intended to direct pilgrims to the church at Killinaboy. This church may have once housed a relic purporting to be a fragment of the “True Cross”. This is indicated by a double-armed cross in the west gable of the church. Getting There: See the Road Atlas page 40, H 3. 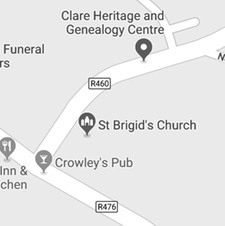 The Clare Heritage Centre is located on Church Street in Corofin, the R460. 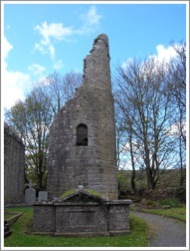 In the Noughaval civil parish there is a ruined 13th century church. South of that there is a limestone cross that may be 12th or early 13th century. It stands just under four feet in height in its present condition and location. The shape of the ring is not circular but resembles some other 12th century cross in this regard. The armpits are small and round. Getting There: See the Road Atlas page 40, H 2. 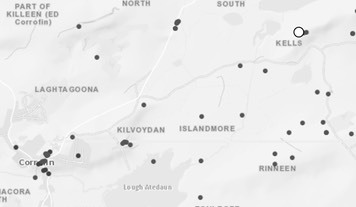 Noughaval is noted on the Road Atlas just northeast of Kilfenora. Nothing is known of the history of this site. It is located near a hill fort and may have been related to the fort as a church site. See the Road Atlas page 41 D 2/3. 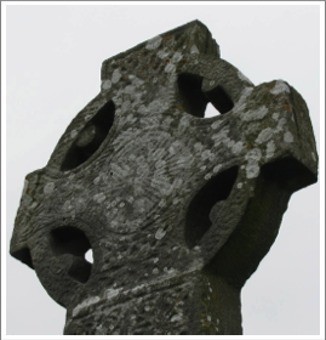 The Cross is located on a ridge a half mile north of Kells Bridge and 700 yards west of Kells Cottage in a place called The Whitethorn of the Blessing. It is loose of the foundation of a small house or church located 67 yards north of a fort. (Macnamara pp. 31-32. 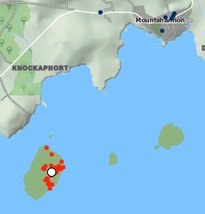 Clare Library, http://www.clarelibrary.ie/eolas/coclare/places/holy_island1.htm, Citing Journal of Thomas Dineley, 1681; A Description in 1845 in County Clare A History and Topography by Samuel Lewis, and records of the Iniscealtra Parish. Healy, John, Insula sanctorum et doctorum, Sealy, Bryers and Walker, 1890. http://www.clarelibrary.ie/eolas/coclare/places/holy_island1.htm II. Ferrar, John, The History of Limerick, Ecclesiastical, Civil and Military, From the Earliest Records, to the Year 1787, A Watson, & Co., Limerick, 1788. 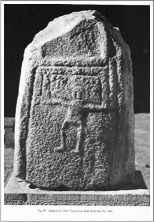 Macalister, R. A. S., On a Runic Inscription at Killaloe Cathedral, Proceedings of the Royal Irish Academy, Section C: Archaeology, Celtic Studies, History, Linguistics, Literature, Vol. 33 (1916/1917), pp. 493-498. 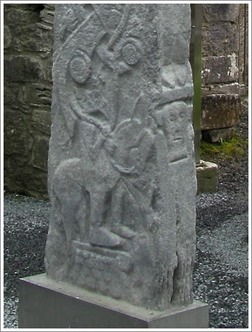 Macnamara, George U., “The Ancient Stone Crosses of Ui-Fearmaic, County Clare,” The Journal of the Royal Society of Antiquaries of ireland, Fifth Series, Vol. 10, No. 1 (Mar. 31, 1900), pp. 22-33. Madden, Gerard, Holy Island: Jewel of the Lough, A History, East Clare Heritage, 1990. Ger continues to offer trips out to the island. 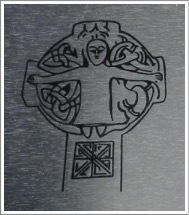 Meehan, Cary, Sacred Ireland, Gothic Image, 2004. O’Corrain, Donncha, Dal Cais — Church and Dynasty, Eriu, Vol. 24 (1973), Royal Irish Academy, pp. 52-63. O’Donovan, Edmond, Limerick: New Discoveries in an Old City, History Ireland, Vol. 11, No. 1 (Spring, 2003), pp. 39-43. Westropp, Thomas Johnson, Killaloe: Its Ancient Palaces and Cathedral. (Part I), The Journal of the Royal Society of Antiquaries of Ireland, Fifth Series, Vol. 2, No. 4 (Dec., 1892), pp. 398-410.